Relax on the beach and enjoy the beautiful seaside while chasing for the rewarding features such as Wild Nights, Stacked Wild Every Spin, Wild Nights, Hi Roller mode and Free Spins with multiplied winnings in Tiki Paradise, a 5-reel 3-row 10-payline slot machine produced by Playtech. 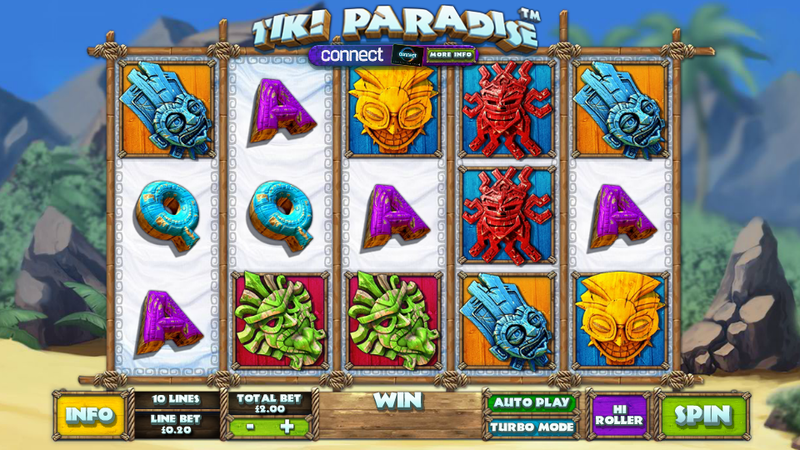 The title comes in both free play and real money modes, and you can learn how to win after reading the Tiki Paradise slot review. Want to see how Tiki Paradise works? Select a recommended casino site from the list below and start playing for free or real – our screenshots will give you a sneak peek! Colorful Polynesian masks have a higher rating than playing cards and you can score 250 coins for 5 of the kind. When get 3+ Scatters, you’ll receive 10 free spins and a chance to choose a special feature that may result in a big win: Win Multiplier applies a random multiplier to the entire score, the Stacked Wild Every Spin adds 1 Wild on every free spin, while the Consecutive Symbols Win pays for 3+ matching icons appeared one after another on the paytable. A few tips to score a larger prize: activate the Hi Roller mode and play 5 games that cost 10x your regular stake, but eventually pay much better. The Wild Nights Feature may be triggered at a random occasion during the base mode and you’ll have to define a reel to acts as the trigger over which a flaming torch may pass and create stacked wilds. If this reel was touched, the Win Shuffle will be activated and all reels will switch their positions in order to help you form more winning combinations. As a part of the Playtech Omni-channel, this is a game you can unlock the features when play online, in-shop and from Android or iPhone. There is no need to download an app if you want to play for fun on the supported sites. 3. What is the RTP factor of Tiki Paradise? According to the info from the recent winners, they dealt with the RTP of 94.05%. Packed with attractive and rewarding bonus rounds, this is a cross-platform title that will surely please the most ambitious players, presuming they have nerves of steel and won’t mind a bit higher volatility.